Hair grows on average 1/2 inch per month. Some sources state 1/4 an inch per month. How is your hair growth? Which category do you fall under? Until your hair root dies, your hair is always growing. How fast it grows depends on the health and diet of the individual. Genetics plays a role in hair growth. However genetics will not stop you from growing your hair to mid back length or waist length. Genetics are not the sole indicator of you reaching long lengths. Lots of women desire long, healthy, easy to style hair. Although most will not admit it, because they fear not achieving such a big goal as waist length or hip length hair. It is hard to aim for hip length hair when your hair has never grown passed shoulder length. 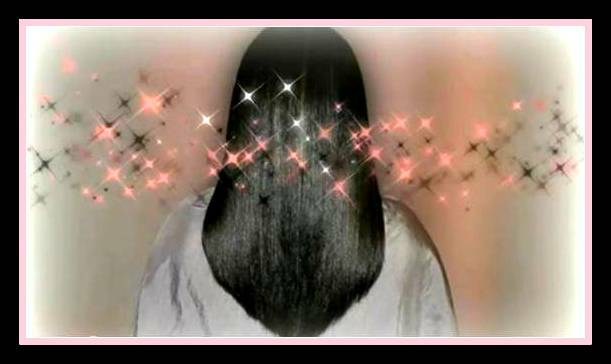 Long hair is beautiful, versatile, youthful and sensual. Where are you in your hair growth journey? Are you reaching your hair length goals? If not are you even setting length goals? Remember you have to set a goal first. Set it, speak it, do the work and enjoy the manifestation. Based on the average hair growth per month being 1/2 inch, here is an ideal as to where you should be length wise in your journey. HAIR STATS: Sapphire's been natural for two years and she started out with a 2' Afro. She does not comb or brush her hair, she finger detangles. She does not use harsh heat, such as blow dryers or flat irons. She follows a healthy regimen on a regular basis. Therefore she only trims 1/4 inch every fourth month. This equals 1 inch per year. 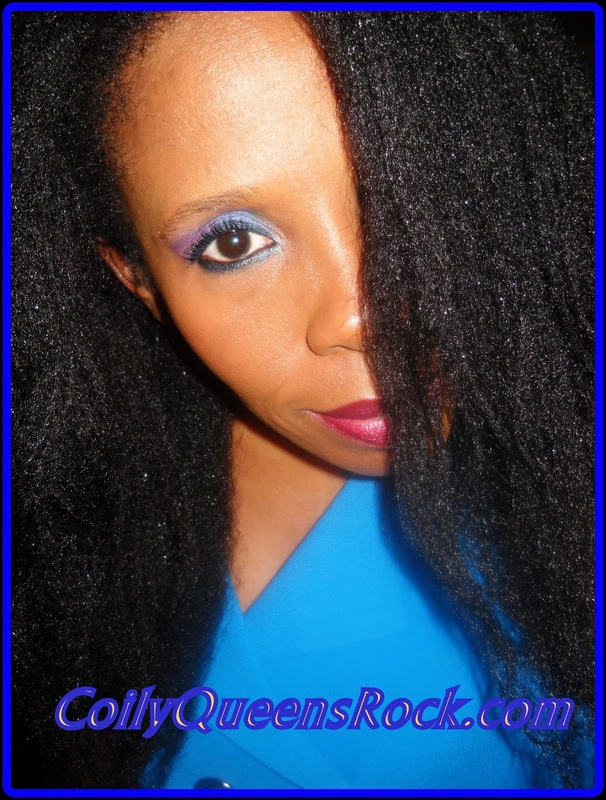 HAIR STATS: Violet started her natural hair journey 3 years ago. She started out with 4 inches of natural hair. She follows the CoilyQueens Regimen so her hair stays really healthy. She does flat iron her hair twice a year. That is the only time she uses a comb. She trims 1/2 inch every 4th month. She loses 2 inches per year to trims. Notice Violet has to trim more hair each year, because she chooses to flat iron her hair twice a year. The harsh heat leaves her ends frayed and split. If she did not use harsh heat she would be very close to waist length in 3 years. How does your hair growth compare to Sapphire's or Violet's? Insert your own numbers into the formula. What are your length stats? It is good to know if you are above average, average or below average. Start a hair growth journal today. If you are below average with your hair growth, do you know why? 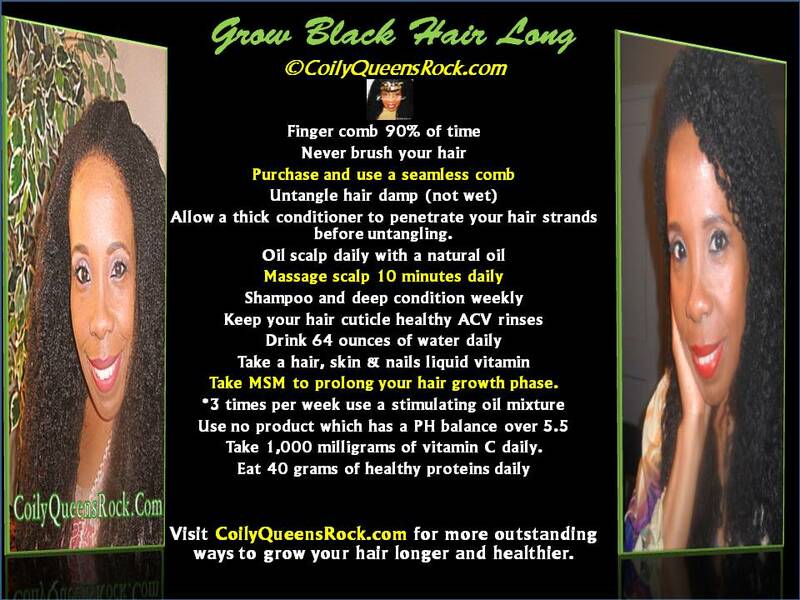 Yes there are things you can do to increase your hair growth rate. Check out the liquid gold box in the right hand column to order.